Comic Relief delivered another spectacular evening of top TV treats in the UK on Friday, as Red Nose Day 2011 entertained the nation while raising an incredible sum of money to help poor and vulnerable people in the UK and Africa. The TV event raised £74,360,207 (US$118 million) – the highest total reached on the night in Red Nose Day’s 23 year history. The TV extravaganza featured appearances by Justin Bieber, Paul McCartney, David Tennant and Susan Boyle. The total includes £1,375,037 raised by the nine Red Nose Desert Trekkers – Ronni Ancona, Craig David, Lorraine Kelly, Scott Mills, Olly Murs, Dermot O'Leary, Nadia Sawalha, Kara Tointon and Peter White – who all completed a gruelling 108 kilometre trek across the Kaisut Desert in northern Kenya. Also included in the overall total is £3,165,705 raised by Radio 1. £543,284 of this was raised in support of Scott Mills and the Desert Trekkers. The remaining £2,622,421 was raised by the amazingly dedicated Radio 1 listeners in support of Chris Moyles and Comedy Dave Vitty and their unbelievable and record breaking 52 hour marathon radio broadcast. Even the British Government backed the public’s incredible support for this year’s Red Nose Day with £10 million support for Comic Relief’s work in improving health and education across Africa. This contribution by the Government matches Comic Relief’s own commitment to spend £10 million in these areas. 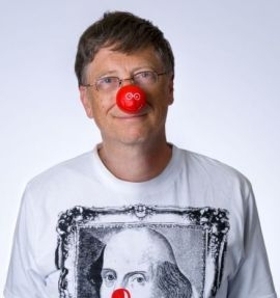 Even Bill Gates joined in the fun – by donning a Red Nose and stylish Vivienne Westwood designed Red Nose Day T-shirt. Presenters Fearne Cotton, Lenny Henry, Davina McCall, Michael McIntyre, Graham Norton, Jonathan Ross, Dermot O’Leary, Claudia Winkleman, Jimmy Carr and Alan Carr rallied the troops into action and led us through the night with great aplomb and humour. Peter Kay returned with his third Comic Relief music collaboration, this time as his alter-ego Geraldine McQueen and performing alongside the superstar singing sensation that is Susan Boyle. The third instalment of James Corden’s Smithy trilogy, which saw Smithy coming to the rescue of Comic Relief, with the help of some showbiz pals including Sir Paul McCartney, George Michael, Keira Knightley, Tom Felton, Rupert Grint and Gordon Brown. Five comedians became Fake That for one night only – Alan Carr, Catherine Tate, David Walliams, James Corden and John Bishop starred in this one-off music video which saw the real Take That auditioning the wannabe boyband. Kim Cattrall, Jennifer Saunders, Joanna Lumley, Victoria Wood and many more stars came together for ‘Uptown Downstairs Abbey’ – a side-splitting spoof of last year’s hit show. Andy Murray made a guest appearance in a special Outnumbered sketch, which saw the usual Brockman family high jinx when they ran into the Tennis ace. The cast of Miranda starred in an unforgettable sketch, which saw Miranda starring with JLS as she took over Louie Spence’s famous role at the Pineapple Dance Studios with hilarious results. Culinary novices Miranda Hart, Ruby Wax and Claudia Winkleman went ‘spatula to spatula’ in a hilarious cook off for Comic Relief does Masterchefas they donned their chefs hats to cook up a feast for none other than the Prime Minister at Number 10. There was double trouble in a specially shot mini episode of Doctor Who as two Amy Ponds turned up in the TARDIS. TV Burp’s cheeky Harry Hill created his own version of ‘Autumn Watch’ with a string of guest appearances including Bill Oddie, Alex Jones, Sean Ryder and Olly Murs. Highlights from Ant & Dec’s Big Red Nose Broadcast, which saw the comedy duo spend a day gatecrashing TV and radio shows earlier in the week. For those who missed out or just can’t get enough of the Red Nose Day TV gold, many of the highlights will be available to download exclusively from iTunes. As well as being able to buy the full sketches of Smithy, Fake That, Miranda, Uptown Downstairs Abbey and more, you can also find exclusive never seen before ‘making of’ specials of both the Smithy and Fake That sketches.